Last Date for IAF Rally 22/02/2019. Seoni, Shahdol & Shivpuri districts of State of Madhya Pradesh. 20/02/2019 Physical Fitness Test & Written Test Ashok Nagar, Burhanpur, Chhindwara, Datia, Dewas, Dindori, Jhabua, Khandwa, Narsinghpur, Sidhi, Sheopur, Singrauli & Umaria districts of State of Madhya Pradesh. 1.6 Km run – within 6 minutes 30 second. 2. Candidate Need to Reach the Rally Venue Along With Required Documents(As Mention in Notification) on the Date and Time Given Below. FDDI Immlikheda Chownk Chhindwara,Madhya Pradesh(various districts of MP will be covered under it) up to 10 AM on 17 February 2019 and 20 February 2019. A. 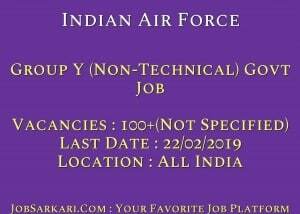 Last Date for Indian Air Force Group Y (Non-Technical) Govt Job Posts is 22/02/2019. A. 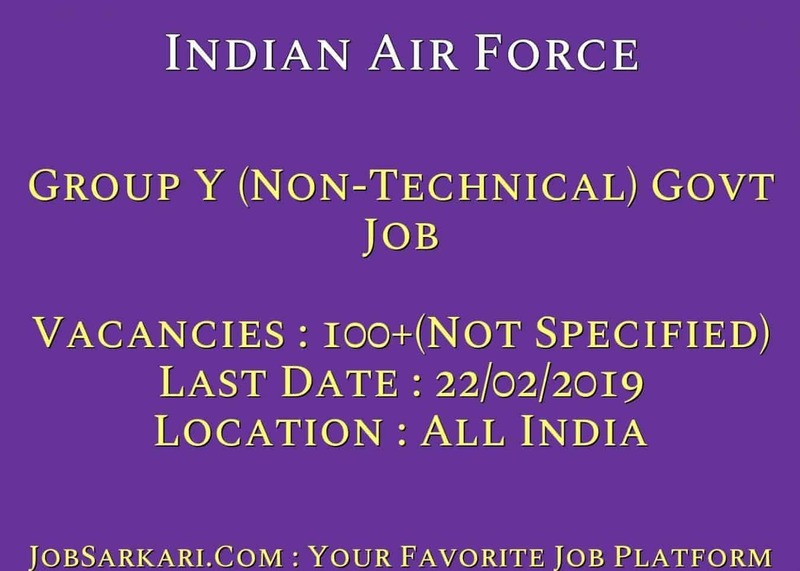 There are about 100+(Not Specified) Vacancies in Indian Air Force Group Y (Non-Technical) Govt Job Posts. What is the age required for Indian Air Force post.